About two weeks ago I introduced the Unchecky program. In this period of time, Unchecky was translated to 8 languages, the Unchecky website was translated to 3 languages, Unchecky was reviewed by numerous well-known websites, and I’ve received lots of positive feedback. But Unchecky has one important limitation, which was raised right after Unchecky was released – It can’t handle the web. 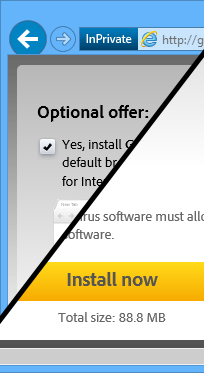 While most programs present their offers in the installation process, some are showing a checkbox in the browser, before downloading. And obviously, this checkbox is checked by default. Why Unchecky can handle native application, but not the web? There is more than one browser. At the minimum, Internet Explorer, Firefox, and Chrome have to be supported before claiming that Unchecky indeed supports the web. I have no experience in writing browser add-ons. Actually, I bet handling an HTML page is much easier than handling a native Windows dialog. But the thing is I don’t have any experience with browser add-ons, and that’s why I’m writing this post. In spite of the mentioned above, I decided to try and implement a Browser Helper Object (BHO) for Internet Explorer. After lots of poking in the dark, I came up with a POC implementation which is able to uncheck a checkbox, but is not something ready for a release. I’m not sure how correct it is, and there’s no way to check the offer if the user really wants to as the BHO uses a timer. The code can be found in the unchecky-bho GitHub repository. Are you familiar with BHO and/or ATL? It will be great if you could review my code, and implement a confirmation message box. I believe it should be fairly easy for someone familiar with the API. Do you have experience with writing add-ons for Firefox and/or Chrome? I’ll happily accept an implementation of the above for Firefox and Chrome browsers. Please contact me if you’re willing to contribute. Posted in Software, Updates by RaMMicHaeL at December 12th, 2013. You, sir, are a saint! Now I can install Unchecky on friends’ and clients’ computers instead of cleaning them up so often. I am not a programmer, beyond simple scripts, but I will spread the word to the best of my ability. I wish you the best of luck and many well-deserved donations. Thank you for your feedback and the support! I’m glad you find Unchecky useful. This is a very worthy project and implementation of a software idea. I too will use it in my daily passer-by’s with friends, family and O.I.P.’s (other important people). P.S. I don’t know any programming but wish I did; so no experience with BHOs or ATLs. P.S. Is their a way to donate to your project….? Could you provide a screenshot of what you’re seeing? I would like to confirm that Unchecky is working on on all my pc’s. I challenge any and all coders to please respond to the call for Extension code addition.